You Just Got Orthodontic Appliances - Now What? Nature helps the tooth loosen to relieve the pressure, but there is temporary discomfort while this happens. Gradually the bone makes room on the compressed side and new bone grows in to support the stretched side...so the supported tooth becomes comfortable again. But we can't stop there! On your next appointment the process is repeated. Once your tooth has loosened from this first movement, each new adjustment is easier and little or no discomfort follows. Once your teeth have been placed where we want them your retainer holds them in their new position allowing the bony support to return to a normal and stable condition. 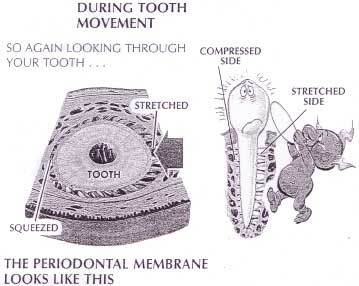 Tooth movement is really a normal physiological process that allows your orthodontic correction to occur. As your mouth adjusts to the appliances that we have placed, it is normal to feel soreness during the first few days. Try to eat soft foods and you may wish to take a mild, non-prescription pain reliever (Advil or ibuprofen) until the tenderness subsides. For maximum effectiveness, it may be best to take such medications 1 to 2 days before the discomfort begins. Tenderness will vary from patient to patient, however, most soreness should be gone within a few days. This will make chewing easier for you and less uncomfortable if your teeth are sore. Cutting your food into small pieces will minimize the amount of chewing. Softer foods will make it much easier to chew. By eating slower you will decrease the likelihood of biting your tongue and cheek. Although the brackets have been rounded and smoothed, you may find it helpful to use a small piece of wax around the bracket. We will give you a supply of wax at the start of treatment, and you can always call our office for more if your supply of wax runs out. Limit the amount of sugary foods you eat. Sugar can increase the plaque that forms on your teeth, causing cavities and permanent white marks. Many foods, like breakfast cereals, have hidden sugars. If you do choose to eat sugary foods, please brush immediately after. Avoid between meal snacking. The worst thing you can do is drink soda or eat crackers and chips between meals without brushing!!! Soft drinks and lemons contain a substance that can cause permanent damage to the enamel on your teeth. If you decide to drink soft drinks or eat lemons, we recommend that you brush thoroughly to decrease the possibility of damage. If you are unable to brush, please rinse your mouth with water. Do not bite or chew on pens, pencils or popsicle sticks. These objects may break brackets, bend wires, and loosen cement. If you play sports, always remember to wear a mouthguard. TO MAKE IT EASIER FOR YOU, BEFORE PLACING YOUR FIXED APPLIANCES, WE MAY HAVE TO MAKE SPACE BETWEEN YOUR TEETH TO ALLOW THE BANDS TO GO INTO PLACE. SMALL SPRINGS OR PLASTIC MODULES are two types of spacers we use. Then slowly, over a few days they gently move certain teeth slightly apart to allow us to accurately place bands on your next appointment. YES, this causes temporary soreness but that goes away in a few days. RINSING with warm salt water can help relieve this soreness and even your usual chewing can help speed your teeth getting back to normal. IMPORTANT! - If you lose a spacer, call us so we can replace it. 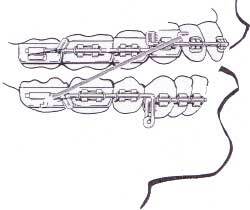 We need that space at your next appointment to place your braces in the most comfortable manner. Note: Do not floss where we have placed the separators. There are certain types of orthodontic problems that are caused by the lack of enough bone growth to accommodate the upper teeth. In other cases there is room for the upper teeth but the palate, or roof of the mouth, is so narrow that speech is impaired or made difficult. In still another type, the palate is so high that it actually cuts down on the amount of air that can pass through the nose, so that deep breathing, without opening the mouth, is almost impossible. In all of these cases, a palate spreading device is most helpful. Well, that sounds pretty drastic, doesn't it? Surprisingly though, it really isn't. The maxilla, or upper jaw, is joined in the center by a suture, or joint, which allows it to be painlessly separated and spread. Temporarily you may see a space develop between your upper two front teeth. This will slowly go away in a few days. Once this has occurred, the two halves knit back together and new bone is laid down to make the jaw wider. So that's how your palatal spreading device works. It won't hurt. Your teeth will be a bit uncomfortable for a day or two, and sometimes, about a week after the device is cemented into place, you may feel a little "itching" in the roof of your mouth. 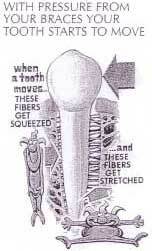 Don't worry, this is normal, because the fibers there stretch and expand. This palatal spreading device is cemented in place and the screw must be turned by you or your parents each day - usually only once at night. The key is inserted into the hole and then pushed all the way to the back of the throat. This will bring the next hole into view. Another type requires a small wrench that fits on a slot that you push toward the back of the mouth. 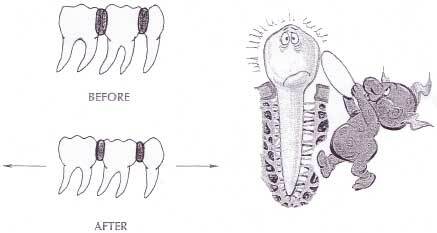 After the palate has been widened enough, it is necessary to hold it so new bone will fill in the space. Plastic is sometimes added to the jack screw so it becomes a stable splint. We need to hold the expansion we have created and allow the new bone time to fill in. 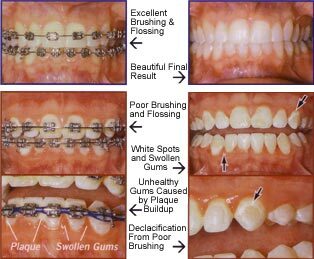 There are many methods that orthodontists may use to correct a particular problem. In your case we may decide that the Herbst appliance will help bring your chin forward and improve your bite better than any other we could use. In as much as your face is still growing, this position will help speed the growth of your lower jaw. Your total treatment time will usually be shortened. What may you expect now that you are wearing this appliance? The first few days you may have some light tenderness of your jaw muscle. You may have some irritation to the inside of your cheeks. This is usually due to the extra fullness made by the heads of the screws. 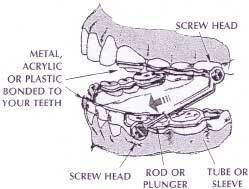 The screws are necessary to allow the jaws to work up and down freely so you may chew with as much ease as possible. Placing soft wax over these places will help. As your mouth becomes accustomed to having the appliance in place twenty-four hours a day, you may discontinue the wax. If soreness persists after a few days, call us. We want you to be as comfortable as possible. During your first few days you may have to eat a soft diet until you become accustomed to chewing in the new position. Gradually you may go back to your normal diet. Do avoid those foods we have previously mentioned. NOW SOME PRECAUTIONS. Please don't play with your new appliance. If you open too wide, the little plunger attached to your lower jaw may slip out of the sleeve that is attached to your upper jaw. Should this happen, look in a mirror, open very wide, slip the little rods or plungers into the tubes or sleeves of the upper part and close normally. Toothbrushing with your Herbst appliance requires some extra time. Brush thoroughly all around and leave no food trapped under the tubes. If you have a water irrigator, such as a Water Pik, rinse thoroughly once or twice a day. Rinse each day with a fluoride rinse. If you prefer, brush normally, rinse, and then brush with a fluoride gel. Don't rinse after you finish this brushing. Take care of your appliance and you will be amazed how quickly your jaws will change. 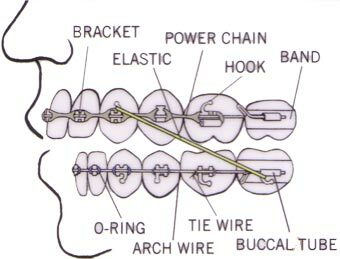 During various phases of treatment, small elastics or rubber bands are used as a gentle but continuous force to help individual tooth movement or the aligning of one arch to the other. But when they are worn one day and left off the next, your treatment slows to a standstill or stops. 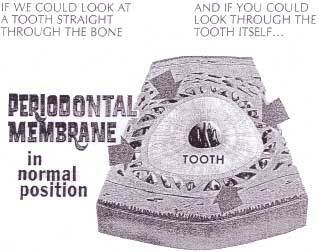 Because the tooth "jiggles" back and forth and actually sets up a resistance that virtually prevents normal movement. Follow instructions EXACTLY, and you will get better, faster, more comfortable results. Usually, after about two days, any discomfort from the elastics disappears. But if you leave them off "to let my teeth feel better," you have done exactly the wrong thing! Stay with them. 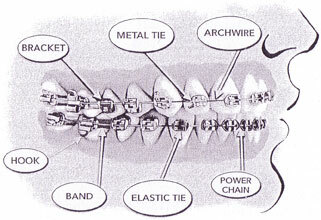 In most, though not all orthodontic treatment, the rubber bands are used toward the end of the treatment. If we assign them to you, take heart they are speeding up the day you get your braces off! Keeping Your Appointments and Being on Time. Each missed appointiment can lengthen treatment time by about a month. Broken appliances can stop or reverse treatment progress. Please be sure to wear a mouth guard to protect your teeth and braces when participating in contact sports. Extensive repairs may require an appointment during school or work hours. Wearing Your Elastics and Appliances as Instructed. Your teeth won't move if instructions are not followed. Keeping Your Teeth and Braces Clean. All efforts should be focused on designing your new smile, not on unhealthy teeth and gums. Clean teeth with healthy gums move faster. If something is loose or broken, please call during office hours. It's best not to wait until your next appointment. Place any piece that comes off in an envelope and bring it with you. In the rare case of discomfort that you cannot manage, we are available at any time. Use the following diagram to tell us what is loose or broken.